Now that everything is going digital, it is important for your business to keep up with the changes. Advertising on Snapchat will help your business grow in so many ways, as millions of people use the app every single day. Want to learn how you can use Snapchat for advertising? One of the biggest benefits of advertising on Snapchat is being able to use live content to appeal to audiences. You can take your viewers with you wherever you go during your live video. Then, your audience can feel like they are with you the whole time. Using live content to advertise your company makes you seem more relatable to your customers. They are able to see what you are doing at the exact moment, and thus, connect with you on a more personal level. In addition, your customers will be able to see first hand that you are using the same social media application that they use every day. You can decide to show a live demonstration of your products, similar to a tutorial. You can also create a live video of yourself answering questions about your business and products. The live feature of Snapchat lets you and your customers live in the moment together. Advertising on Snapchat is easy when you can use geofilters. You can create your very own unique Snapchat geofilters. These geofilters must be used locally. Therefore, whenever one of your customers is within the range of your business, they will be able to use your geofilter. For instance, if you are a small business owner, you can create a Snapchat filter just for your small business. Then, whoever visits your business will be able to use the filter as they're taking Snapchat photos. Moreover, you can also create temporary geofilters for an event or special product. These filters can reach an entire city or even the whole state. The geofilter can be used if you are promoting a new, specific product, such as a movie. Make your product visible to audiences and let them know that it is available for purchase immediately. When you make your own geofilter, make sure that it is clear that your company is sponsoring it. 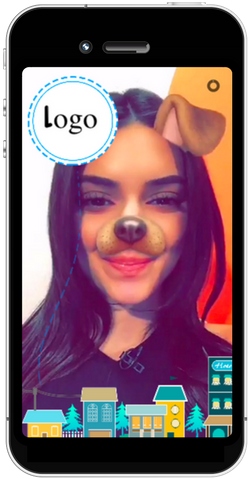 If you have a logo or a company mascot, include that in your geofilter design. Create an awesome geofilter for your company so that Snapchat users will remember who you are and want to learn more about you. One of Snapchat's most fun features for users is the themed filters and lenses. Users enjoy these facial recognition tools to transform themselves into silly characters. Create your own company-sponsored lens for users to use. For example, if you are trying to advertise a new pair of sunglasses that you are selling, recreate a digital image of the sunglasses. Then, create a filter so that users can have a virtual experience of "wearing" the sunglasses. You can create a beachy theme around the sunglasses so that users look like they are sitting on a beach and wearing your product. This can also help users "try on" your sunglasses. If they like the way they look in them at the Snapchat filter, they may want to buy the real pair! Snapchat Stories are very common. All users utilize the Snapchat story feature, which allows a photo to be viewed by all of your contacts for 24 hours. As a business trying advertising on Snapchat, this feature can be very helpful. You can post a video or a photo on your Snapchat story. Take photos of your team or some of your customers using your products. Then, post these as a Snapchat story to advertise your business to all of your followers. The Snapchat story is also a very quick and easy way to send a message out to your followers. Whether it is just an image, video, or an actual message, you will get the word out about your business instantly by posting a Snapchat story. Did we mention that Snapchat stories are powerful marketing tools? To get even more viewers to see your content, consider posting a photo on your city's Snapchat story. Most big cities around the world like New York, Miami, Los Angeles, London, and Paris have their own city-wide Snapchat stories every day. Any user can try to post content onto their city's Snapchat story. After their photo or video content is approved by Snapchat, anyone in the city will be able to view it. You should try to post your own content on the city's Snapchat story so that you can advertise to a wider audience and acquire new followers. Make sure to include your Snapchat handle when you post so that new people can add you as a contact. Snapchat now gives businesses the ability to buy ads, which makes advertising on Snapchat super simple. If you don't want to create your own Snapchat account, you should definitely think about buying Snapchat ads. The ads on Snapchat show up in various places. When a Snapchat user is scrolling through their city's Snapchat story, your ad may come up in the middle. Your ad may also come up as they're scrolling through their own contacts' Snapchat stories as well. Additionally, when users are reading articles or watching videos on the Discovery Channels, your ads can show up on there too. Buying Snapchat ads is very useful to get the word out about who you are as a business, especially if you want a large audience. Thus, you can be sure that your advertisements are viewed universally, and not just by people in your city. Whenever you post something on Snapchat, try to include a hashtag that relates to your business. Then, later on, potential customers will be able to use your hashtag to learn more about your company and find you. Also, you might want to include your Instagram handle or any other social media profile names you have with each post. That way, your customers will be able to follow you via all social media platforms. You want your customers to be able to easily find you or connect with you, right? The best way to get your customers to follow all of your content is by advertising on Snapchat. Snapchat has a feature called Discover Channels. A few brands have their own Discover Channels, such as Refinery 29 and Cosmopolitan. If your business is a type of media brand, you can request to buy your own Discover Channel. Then, you can post your own content on the channel daily. Users will be able to view your content any time they want via your Discover Channel. In addition, as mentioned earlier, if you buy Snapchat advertisements, chances are that your ads will be seen on other brands' Discover Channels. These Discover Channels are viewed by millions of users each day. It will be worth it for you to try to get your own channel or at least buy advertisements that can be viewed on other companies' channels. Advertising on Snapchat is a great way to give your customers some promo codes to use for their purchases. You can add your promo codes to your Snapchat story or include them in your Snapchat ad. You can also mention promo codes if you create live videos or a video for your Snapchat story. Give your users more of an incentive to follow you on social media. If they know they can only get product discounts by following you on Snapchat, then they will be constantly trying to view your content. Your promo codes should be exclusive to Snapchat so that your followers have to use the app in order to find the code. Tell your followers to share the promo codes with friends, so that their friends will begin to follow your account as well. Snapchat influencers are people who have tons of Snapchat followers. Every time they post some sort of photo or video on Snapchat, tons of people will see it instantly. You should consider working with a Snapchat influencer to help you promote your business. If Snapchat users see one of their influencers using your product or even just talking about it, followers will want to buy your product as soon as they can. Advertising on Snapchat is very easy and effective. As proven, there are many benefits to using Snapchat as a marketing tool, especially because so many people use the app. Use these 10 tips to implement Snapchat into your own marketing strategies. Advertising on Snapchat will surely give you the results that you're looking for.